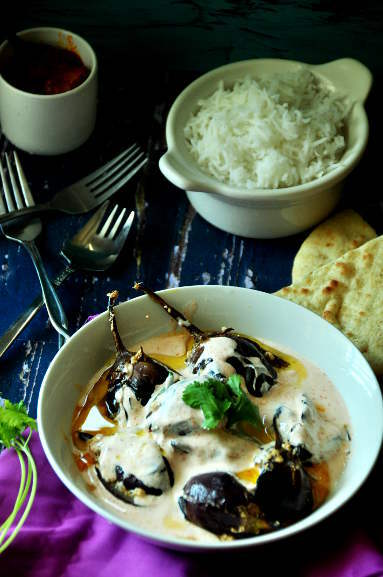 Almost every state in India has their own style of making doi begun or dahi baingan. So, this is one recipe where you can do loads and loads of combination, and I assure use you’ll not get wrong. I like to use the baby eggplants, as the whole eggplants or brinjal, as I used to call while growing up (read before entering USA) gives a good texture to the curry. You can also use the larger eggplants, and cut them into two to three inch size pieces. 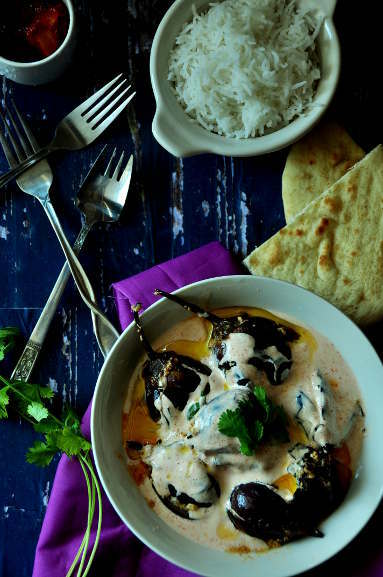 Using asafoetida is an optional step in this recipe, I like the flavor of it and it goes with the whole yogurt and eggplant mix, so I use it. Also, if you want to enhance the flavor of this dish you can temper with curry leaves and sprinkle dry roasted and then powdered fennel seeds. So the possibilities are unending. But, one thing’s for sure, this recipe is a must have for a hot and dry summer lunch. You can also serve this as a side dish with biryani. While the eggplants are getting fried, in a mixing bowl beat the yogurt with 2 tablespoon of water. Add the chili powder, dry ginger powder and sugar. And beat again. Once the eggplants are fried, the skin will turn a darker shade of purple; don’t wait till they turn black; take the eggplants out and place on a kitchen towel to absorb the extra oil. In the same oil add the asafoetida if using, if not then go straight to the next step. As the asafoetida starts to splatter, about 10 seconds, transfer the eggplants back to the pan. Pour the spiced yogurt, and add in the green chilies. Stir and cook covered for about 2 to 3 minutes, or till the eggplants are cooked. You can add a little water if the gravy starts sticking to the pan. If you add the eggplants while the oil is still not hot, the eggplants will absorb less oil. As the say! “Pahle darshandhari phir Gunbichari”…. 10 on 10 on beautiful look of baby Eggplants coated with Doi…. ke bole Beguner kono gun nei….